Trade shows are more than a place of like-minded individuals. It is a place to explore, network, learn, and to be inspired. Though you may meet people at conventions who stimulate your mind and creativity with conversation, if they have not marketed themselves in a way for you to remember them, they are as good as a blur in your mind on the flight back to your home city. The same goes for YOU and Your Booth. While you have the crowd huddled around your booth, anxiously awaiting your next answer or to see a demonstration, your company name needs to stand out in order to be committed to the memory of potential leads. Stand out. Be noticed. Be heard. Be remembered. Generate leads and follow up. Display Banners – Retractable banners and non-retractable banner stands are ideal for trade shows, conferences, seminars, events, lobbies, schools, churches, and any retail location. Sail Sings / Tear Drop Banners – Sail Signs are available in many shapes and sizes certain to attract attention as they sail in the breeze. A Commonly use substrate and also economical. Lightweight. Excellent for posters goin into a fram or for short term display use. May dent and warp. The most durable choice for foam boards. Gatorboard is light-weight and durable. A hard shell casing and dense foam interior make it much less likely to dent or warp than foamcore. Sintra is a very durable material. Heavier and more flexible than foam boards. Typically, a good choice for outdoor use. Chipboard is a thin, pressed cardboard. It is similar to the back of a legal pad. Most commonly used for counter top displays with an easel. MatBoard is a high quality paper mateboard. It is black on both sides and has a black core. Good for portfolio layouts and high quality counter cards. Options here are determined by how the product will be used. Lightweight or medium weight. Does it need to roll? Is durability important? Do you need to use dry erase markers? Does it need to be protected from moisture? Sealed edge or flush trim? 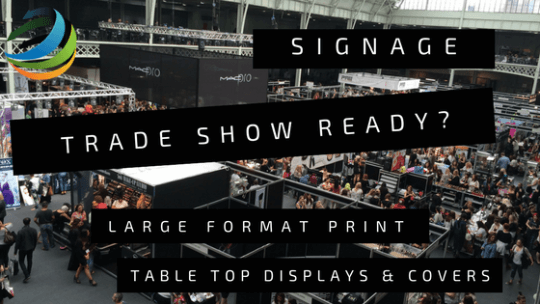 TABLETOP DISPLAY & COVERS – Light weight and portable. Easy to set up! Canopy Tents – are perfect for fairs, festivals and other events both indoors and outdoors. Easy to set up!